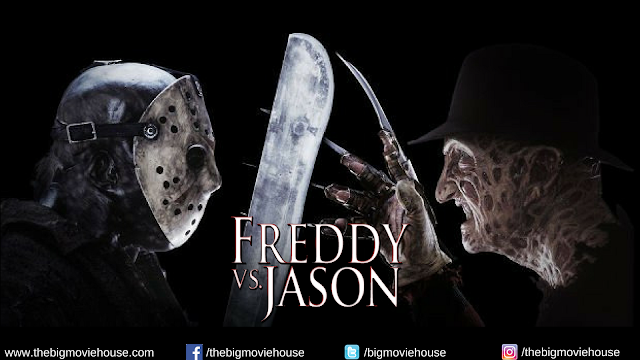 Was Freddy vs. Jason worth the wait or do we just want Freddy and Jason to go away? Now this is the type of Jason movie that New Line Cinema should've made instead of making Jason Goes to Hell. To think that it took them ten years to get it right just baffles me. The movie is the showdown that horror fans have been waiting for ever since Freddy's gloved hand came up out of the ground at the of Jason Goes to Hell. I remember that moment and thinking "Man, that would be a great battle". Freddy has lost his power over the children on Elm street. Without his power he can not induce fear in them. So Freddy decides that the only way to get the children to start believing in him again is to send Jason in to cause a lot of havoc. Only then will people start remembering Freddy. Then he can come in and start his killing spree again. The problem lies in the fact that Jason is an unstoppable killing machine. He doesn't take orders from anyone. He just keeps on killing, until Freddy is pulled into the real world to challenge Jason. The showdown takes place at Camp Crystal Lake. The movie is R-rated and takes pleasure in that. There is no shying away from gruesome kills in this movie. It feels good to know that at least these movies won't be sanitized for the kiddies. The director of the movie is Ronny Yu, who took on another horror series in the form of Bride of Chucky. There he showed that he could handle the way we in America make movies. (Yu is from China where they have a completely different way of making movies) Here Yu builds up to the final showdown with a slew of inventive kills and dream sequences. This man was born to make this movie. I wish that I had some good things to say about the cast, but I don't.. Outside of Robert Englund and Ken Kirzinger, who play Freddy and Jason, the rest of the cast is pretty boring. Monica Keena is alright as the female lead, but Jason Ritter, who plays the male lead, looks like a deer caught in headlights. And Kelly Rowland, from Destiny's Child is just plain terrible. Her scene where she insults Freddy reminded me of a person who is called out on something and tried to come back with something smart, but can't. Despite my complaints, I really enjoyed Freddy Vs. Jason. The movie is well shot and the pace is brisk. And, of course, the final showdown is just plain awesome. You really can't go wrong with this movie.